Atoms and Elements. Chlorine Cl 2 Hydrogen chlorideHCl Methane CH 4 Carbon dioxide CO 2 Draw a line between the molecule and its name. 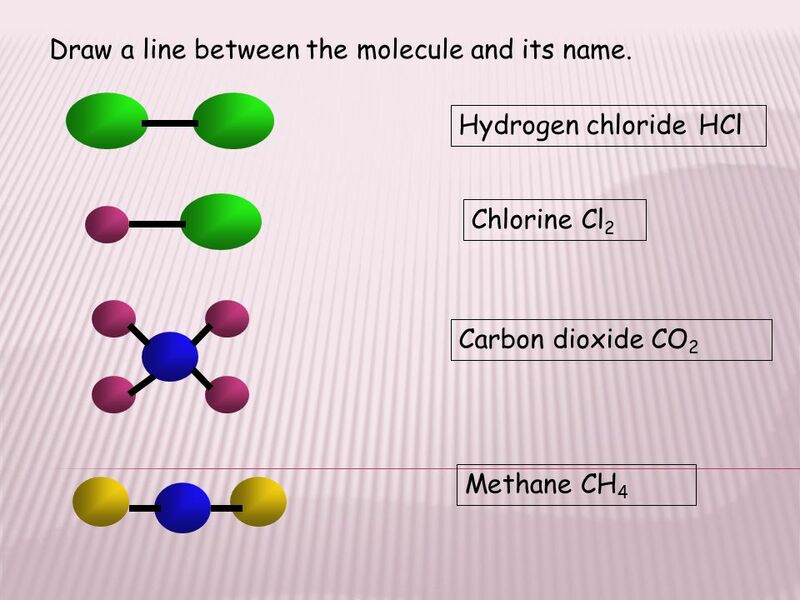 2 Chlorine Cl 2 Hydrogen chlorideHCl Methane CH 4 Carbon dioxide CO 2 Draw a line between the molecule and its name. 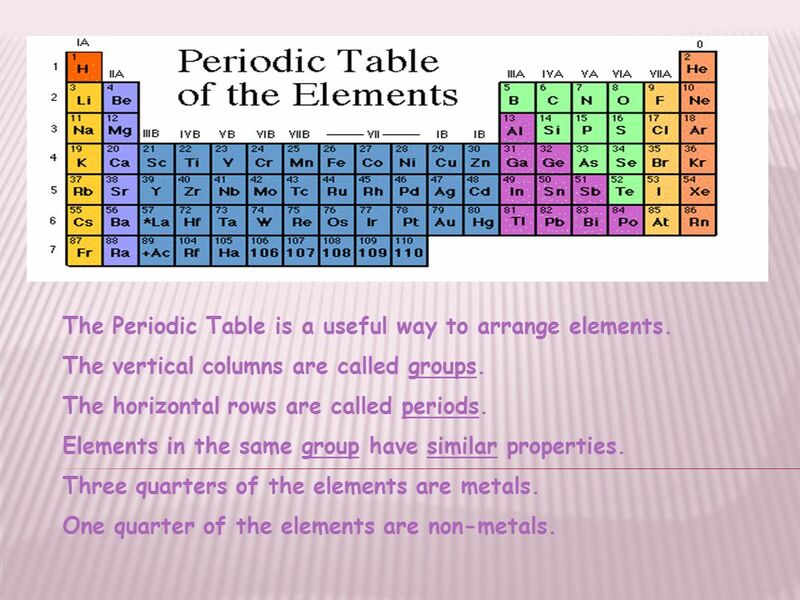 8 The Periodic Table is a useful way to arrange elements. The vertical columns are called groups. The horizontal rows are called periods. Elements in the same group have similar properties. Three quarters of the elements are metals. 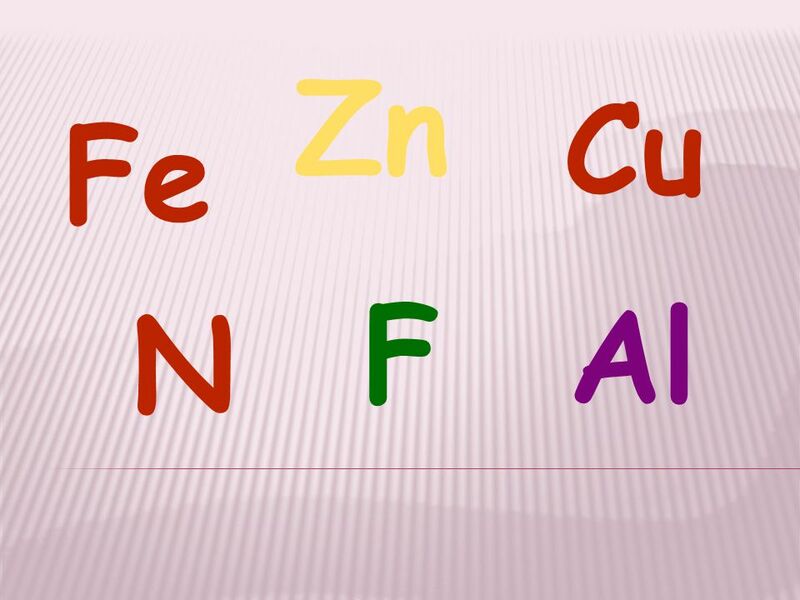 One quarter of the elements are non-metals. 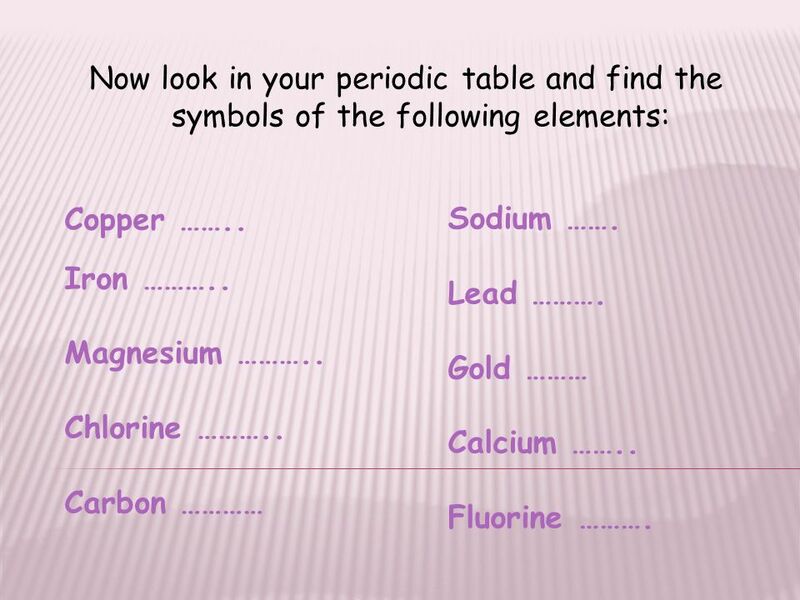 9 Now look in your periodic table and find the symbols of the following elements: Copper …….. Iron ……….. Magnesium ……….. Chlorine ……….. Carbon ………… Sodium ……. Lead ………. Gold ……… Calcium …….. Fluorine ………. 13 1. How many atoms of Hydrogen in one molecule of Methane CH 4 ? 2. How many atoms of Nitrogen in one molecule of Lead nitrate Pb(NO 3 ) 2 ? 3. Sodium oxide has two atoms of sodium for every atom of oxygen. What is the formula for sodium oxide? 4. Magnesium chloride has one atom of Magnesium for every two atoms of chlorine. What is the formula for Magnesium chloride? 5. How many atoms of Nitrogen in one molecule of Ammonia NH 3 ? 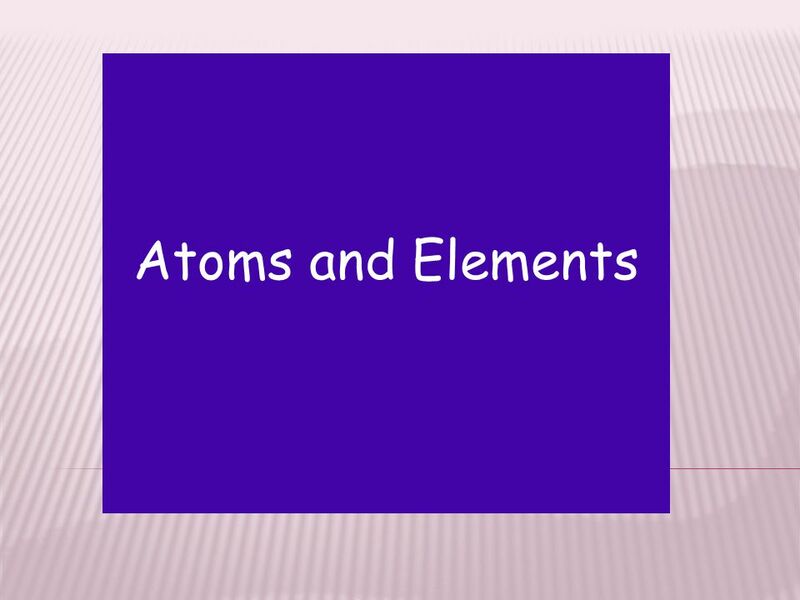 Download ppt "Atoms and Elements. Chlorine Cl 2 Hydrogen chlorideHCl Methane CH 4 Carbon dioxide CO 2 Draw a line between the molecule and its name." Chlorine Cl 2 Hydrogen chlorideHCl Methane CH 4 Carbon dioxide CO 2 Draw a line between the molecule and its name. 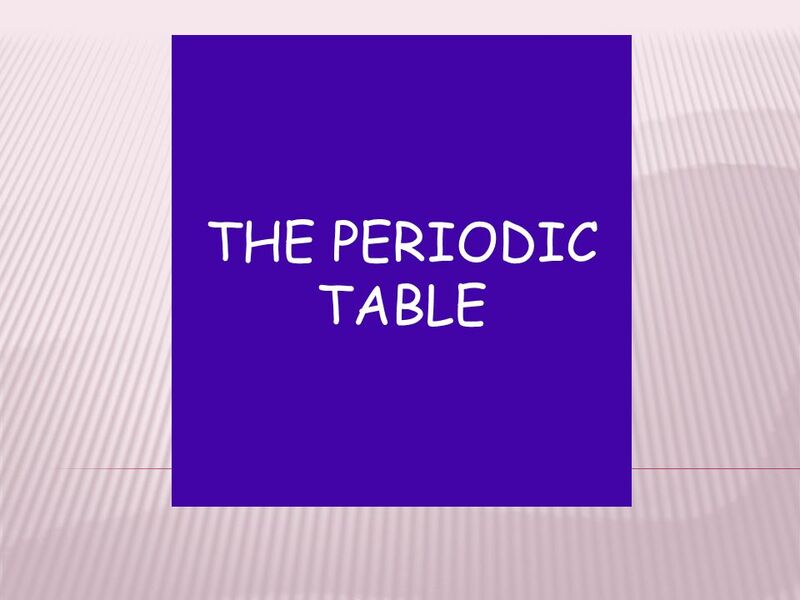 Periodic Table The Periodic Table is a list of all the elements known to man. 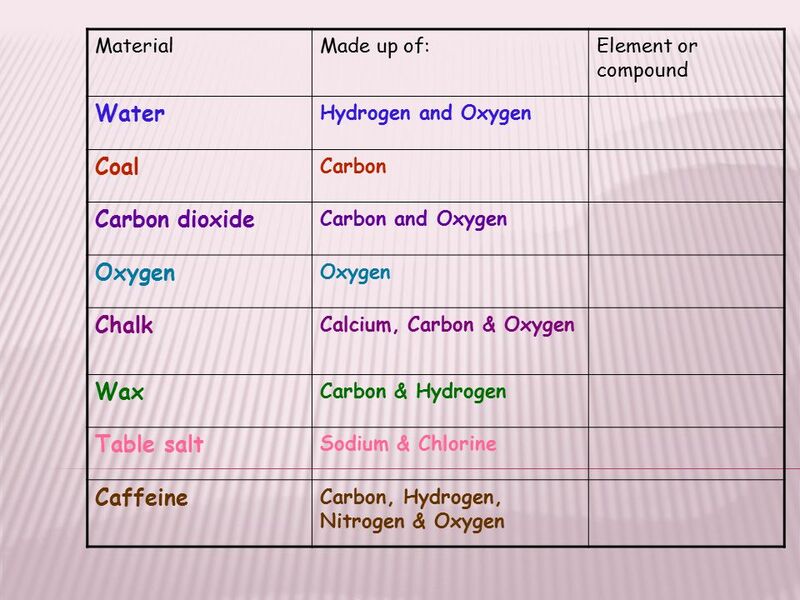 Elements are listed by their symbols, for example Gold: Au and Lithium: Li. 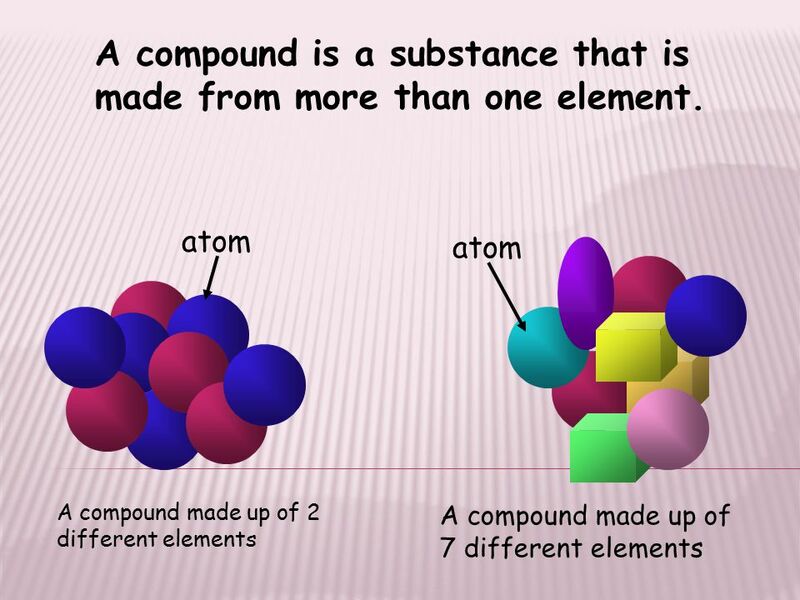 NAMING COMPOUNDS CH We use the word, COMPOUND, when describing an ionic bonded molecule. An example: –NaCl is sodium chloride. 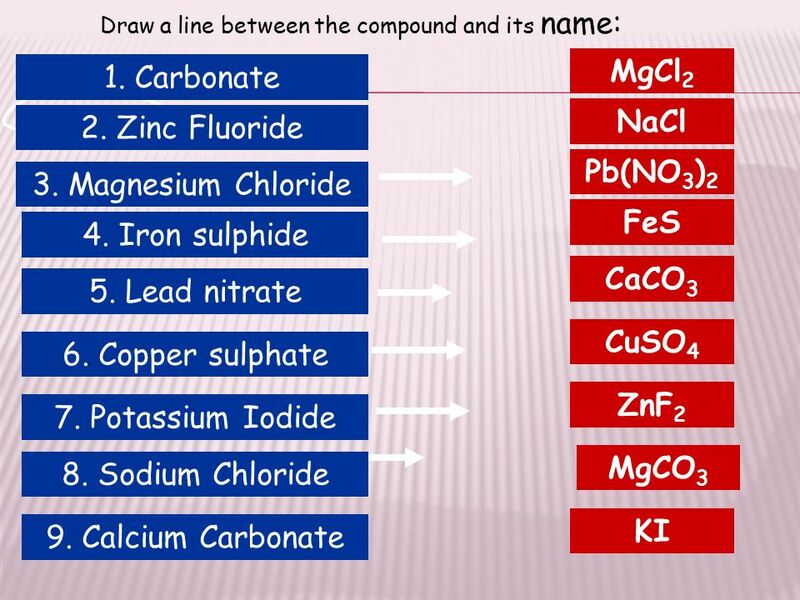 Elements and compounds Grade 9. 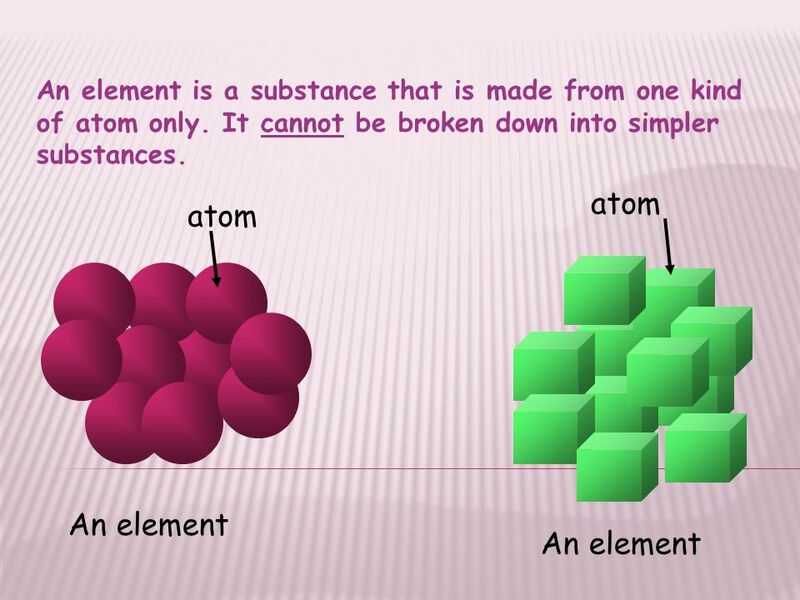 Definition of an element An element is a substance that cannot be made into anything simpler by means of a chemical reaction. 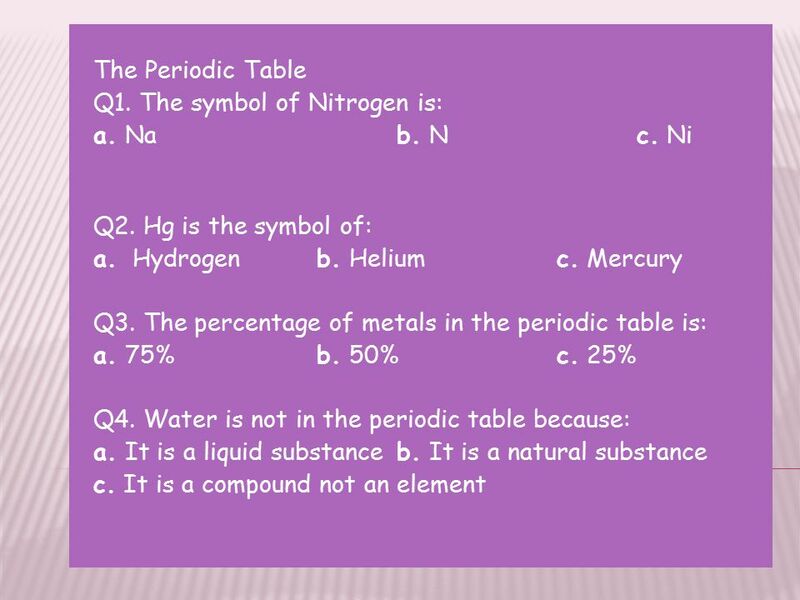 Chemical Formula LO: Become familiar with the symbols of common elements and understand that elements are made of atoms; Swap your theory book with your. USEFUL DEFINITIONS Element A substance which cannot be split into anything simpler by chemical means. Atom The smallest part of an element that can take. D. Crowley,  To understand the term element and compound. Objectives: 1.There are billions of materials in our universe. 2.Those materials are made up from about 100 elements only. 8E Atoms and Elements. Binary Compound A compound made up of two parts, a positive part and a negative part H2OH2O. 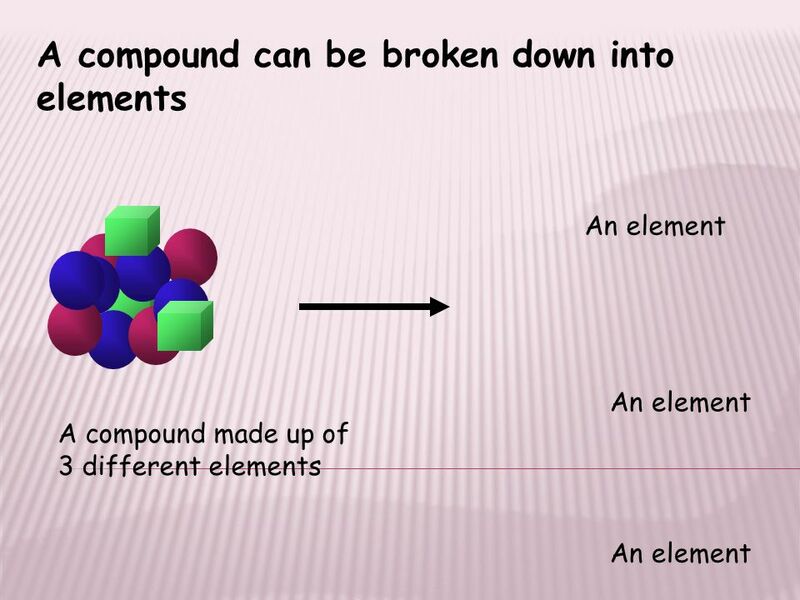 Atomic Structure Structure of the atom Elements Mixtures Compounds. Quiz #8 Chemical Rxns and Safety 1.Why is it important to wear goggles during lab? 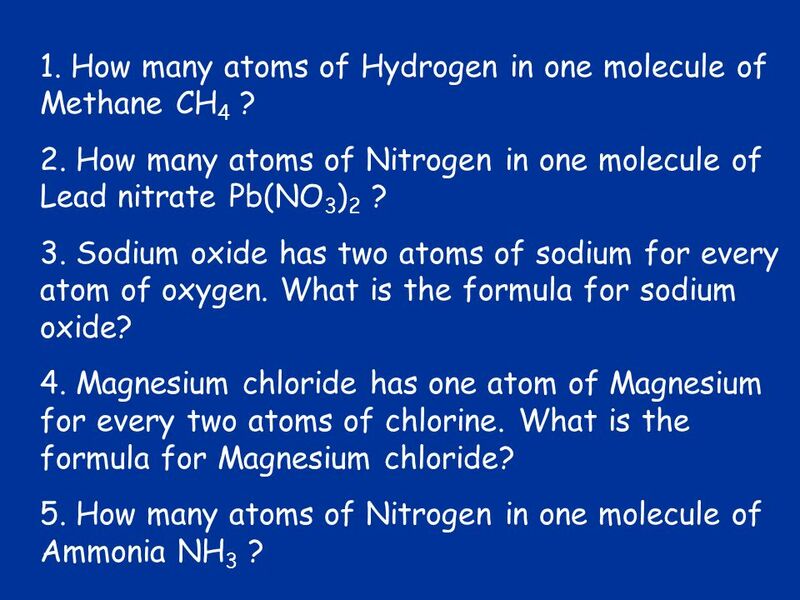 2.What is the correct way to write the formula for Chlorine? 3.In the. Atoms and Elements. Atoms Atoms are the “building blocks” of all matter and are the simplest form of molecule. They are all made up of protons, neutrons.